But Biggs is hit and poisoned by one of the Tusken Raiders, forcing Luke to take the dangerous Diablo Cut through the canyon to beat the Raiders and save Biggs' life. Wondering if he's a pilot or just a farmer after all, Luke manages to make it through the cut, but a group of Raiders shoot down his ship as he emerges from the canyon, and Luke is forced to carry Biggs the rest of the way on foot. Reaching his farm, he calls for a med-pack for Biggs and tells his aunt to call out the militia. That night, with Biggs safe and the Raiders repelled, Luke thinks back over his flight through the canyon, feeling as though he passed some kind of test, and realizing that he can never be a farmer like his uncle. 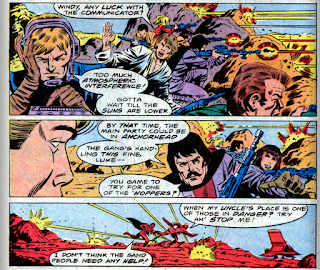 Just then Luke's reverie is broken by Han, who apologizes for being late to take over the watch. But Luke says he doesn't mind, as he's exactly where he wants to be. 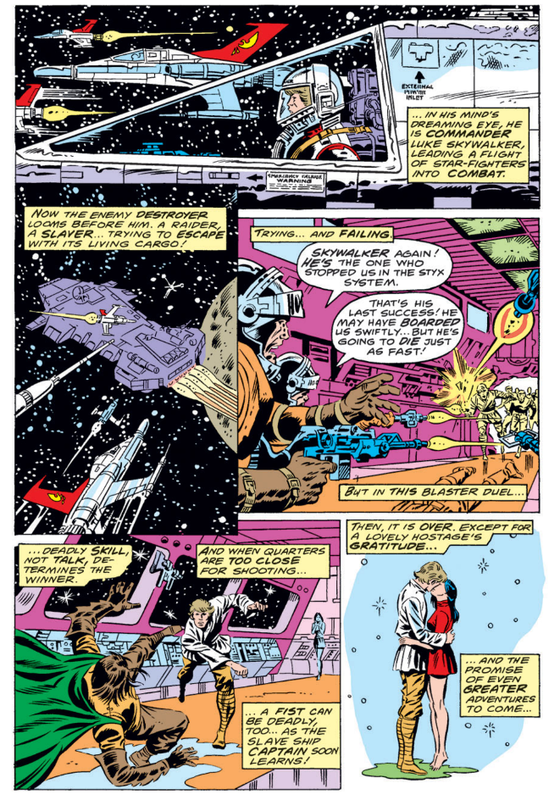 Given that the previous issue teased a story involving the Empire for this issue (and that this issue teases the same for the following one), it seems likely this was an inventory story slotted in because the series fell prey to the "dreaded deadline doom". As such, it's set mostly in the past, and features guest art from Herb Trimpe, well known for a lengthy run on Incredible Hulk in the 70s (including Wolverine's first appearance, making him the first artist to draw the character ) and early issues of GI Joe (and much of its spinoff series, GI Joe: Special Missions) in the 80s. Archie Goodwin remains credited as the issue's writer, though X-Men writer Chris Claremont is credited with the plot, the first of a few credits he'll receive on this series. 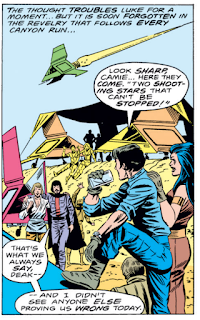 Claremont, a fan of Star Wars, made several references to the films in his X-Men work, and would later co-write with George Lucas a series of sequel novels to the movie Willow. Luke daydreams about becoming the heroic leader of a squadron of star pilots, which pretty much does come true for him in the future. 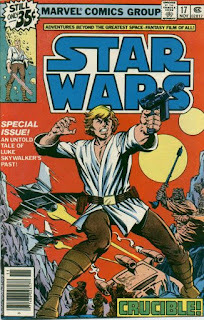 In addition to Biggs, Fixer & Camie, two of Luke's other friends from Tatooine, appear in this issue. 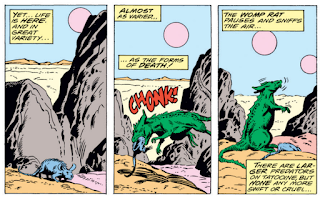 Both appeared previously in issue #1, when Luke raced to tell them about the space battle he observed (which was a scene filmed but cut from the finished film; it appears as a deleted scene on the Blu ray). 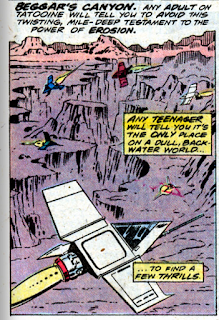 This issue provides the first look at a T-16 Skyhopper, Luke's pre-X-wing vehicle of choice, mentioned in Star Wars but not seen (outside of a model Luke is holding at one point), as well as Beggar's Canyon. 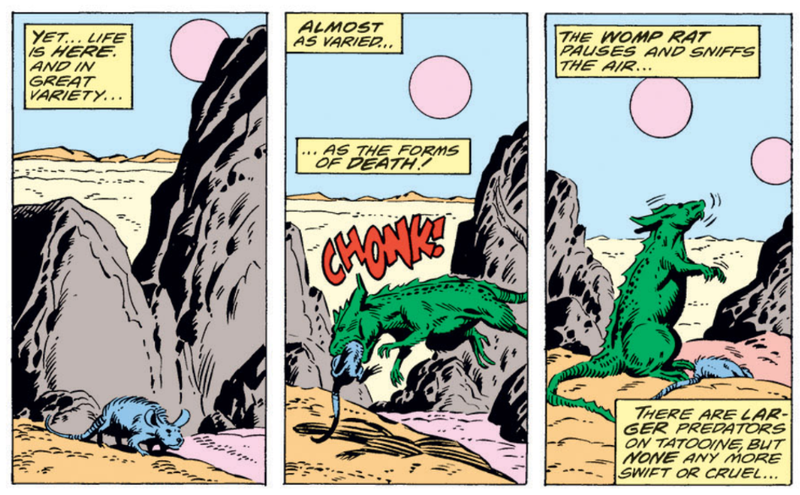 Mentioned in A New Hope, this issue provides the first depiction of womp rats, lizard-like rodents that prowl the desert wastes of Tatooine. It's also suggested that there is a standing bounty on womp rats. 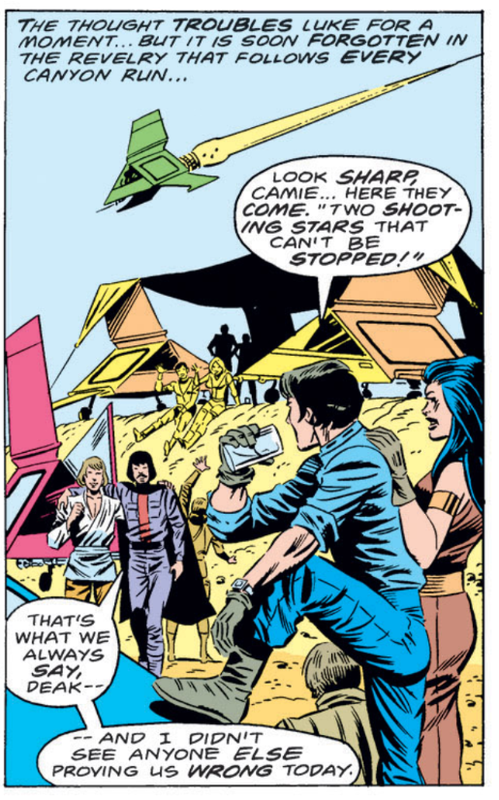 Uncle Owen and Aunt Beru pop up in this issue, looking nothing like themselves. 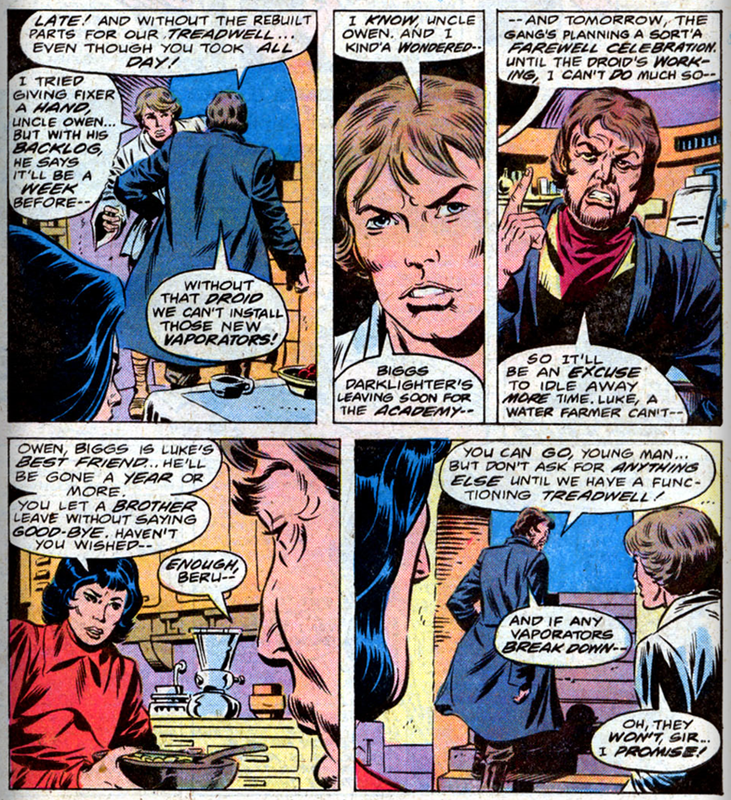 Beru references Owen's brother leaving without saying goodbye, and offers an explanation for why Owen resents him so much; at this time, presumably, this brother was meant to be Anakin (being that Owen is Luke's uncle), though the Return of the Jedi novelization would suggest that Owen is Obi-Wan's brother, and no actual blood relation to Luke, while the Prequels would, of course, later confirm that Owen is technically Luke's step-uncle, and that, aside from one meeting, he had very little contact with Luke's father. Luke's yearning for something more provides an opportunity for another full page spread recapping the events of the film. As fill-in inventory stories go, telling a tale of Luke Skywalker set prior to the events of the first film isn't inherently a bad idea: he is, after all, the central character of the film. 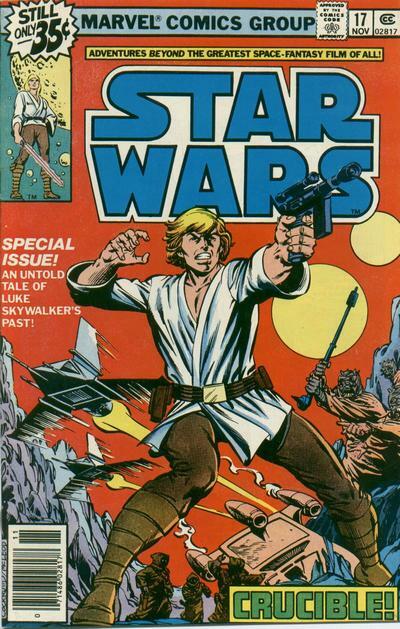 The problem is that because Luke is cast in the movie on the classic hero's journey, not a whole lot of interest can happen to him in a story set before his call to action - the whole point of his character, when he first appears, is that he's just an ordinary kid on the verge of adventure (unlike Han, or even Leia, who clearly have some stories worth telling in their past). 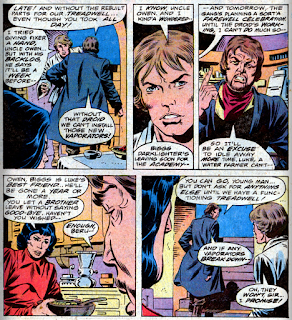 So most pre-New Hope Luke stories (and this issue is the first of what will be something of a trope in the Expanded Universe) all follow the same basic beats: Biggs is usually there, in some capacity, we see that Luke is already a great pilot, that he yearns for something more but feels stifled by his uncle, and it ends with him feeling like he's meant for something more, which is pretty much where the film picks up. Claremont and Goodwin do their best with those beats, beats not yet well-trod when this issue was released. They pick up on a couple pieces of dialogue from the movie to give us our first look at womp rats and Beggar's Canyon, and they deserve props for resisting the urge to show Luke and his friends bullseyeing said womp rats, instead simply alluding to it. 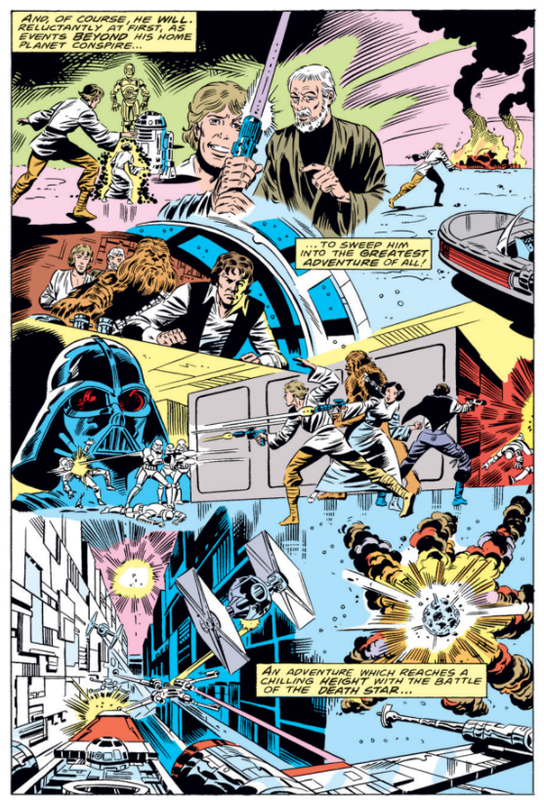 Herb Trimpe, like Infantino an industry veteran, does fine work; nothing here is all that exciting, artistically-speaking, but the storytelling does it job and, Uncle Owen and Aunt Beru aside, nothing is terribly off model. But as much as I appreciate the focus on Luke, there's only so much a story like this can do. This issue does it probably as well as it can, but Luke simply can't have done anything all that interesting in the past, because the whole point of his character, at least initially, is that in the present, he's on the adventure of a lifetime. The book's next storyline finally begins! IIRC, Infantino needed a month break from Star Wars US because he and Goodwin also did Star Wars UK biweekly, which must have been a grueling schedule. An extra cover, plus material to fill the gaps over there when the two lines didn't sync up, week-wise. Anyway, a much better CC fill-in than some of his later fill-ins (or others, for that matter). There are some truly awful ones post-Empire. 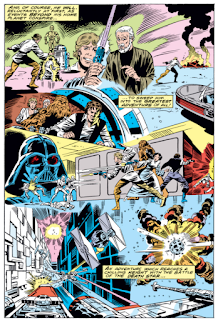 It's bizarre that Trimpe drew pretty much everything else completely, almost perfectly, on-model -- Luke, Biggs (down to the cape), Tusken Raiders, Jawas, banthas, the moisture farm, the landspeeder, even the T-16! -- but got Owen and Beru so wrong. Some of the stuff he nailed had mich less screen time than those two. Yeah. It would be kind-of hilarious, though, if Phil Brown (whose name required looking up) had a refusal of likeness use for merchandising in his contract and Alec Guinness didn’t.